there is also evidence of Roman settlements in the area. 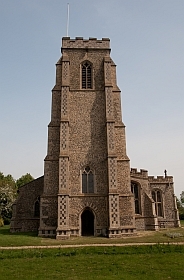 Moving forward to written evidence, it is known that King Alfgar gave his Manor in Cockfield to his daughter Ethelfled who willed it to the great Abbey at Bury St. Edmunds in 1002. The Domesday book of 1086 refers to the Abbot holding 4 carucates (about 500 acres) of land and early feudal charters of the Abbey refer to known inhabitants of Cockfield indicating that it was always an important village, hence the unusually large church. The de Vere family (earls of Oxford) once held land in Cockfield, namely the Manor of Earls Hall. The oldest building today is obviously the church but there are also several ancient cottages: one at Stows Hill has an exposed crown post holding up the roof and the church cottage is said to have been an early Guildhall, to mention but two. The village was always primarily agricultural and would have been self-sufficient. There was a (water) mill ‘for winter use only’ recorded in the Domesday book and this – or more likely its successor – was finally taken down in 1677 by the then occupier of Cockfield Hall who reported that there was not enough water to grind his corn. In 1582 a ‘secret’ meeting was held by the then Rector, John Knewstub, a prominent Puritan, for some threescore ministers out of East Anglia to discuss what might be tolerated and what refused in the Common Book. One always wonders how ‘secret’ a meeting could be when some 60 horses must have come galloping into Cockfield at dead of night! Knewstub went on to speak at the Hampton Court Conference in 1604 and was well loved in the village, where he lived for the rest of his life. During the next hundred years the altar rails were torn down – and replaced – several rectors came and went, and the church had its share of damage done by Dowsing and his minions. By the beginning of the 19th century there were several small schools none of which survived after the Church of England Voluntary School was built in 1856. This still exists as a primary school and in 1976, after a lot of hard work and fund raising, a new village hall was built onto the end of it, which is jointly owned by school and village, thus ensuring maximum usage. 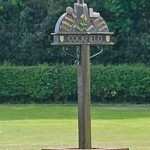 At the time of the Tithe Award (1843) Cockfield had several large non-resident landowners, 22 farmers, 5 professionals, 6 pubs or beer houses, 4 grocers, 3 shoemakers, 2 blacksmiths and 2 wheelwrights, a saddler, a cattle dealer and a carrier. There were also 2 working corn mills and at one time there were no less than five windmills along the village section of the Bury to Lavenham road. Nowadays this road has an hourly bus service (during the day only), the railway has been and gone, and most of the residents no longer work in the village although the population remains much as it always was. 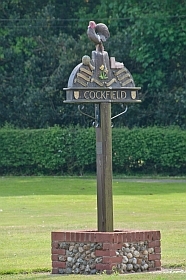 The manorial system dates back to early Saxon times and we know that the Manor of Cockfield, together with several others in the county, was left to Aethelfled, daughter of King Aelfgar, in the mid 10th Century. She duly willed it to the Abbey Church of St. Edmunds (then a small wooden building) in 1002 as instructed by her father. From then on the Abbey held the Manor, together with the advowson of the church, until the dissolution of the monasteries when it was briefly held by the Drury family before being granted to Sir John Spring in 1545. It remained with the Spring family until 1683 when it passed to Sir Thomas Robinson of Kentwell Hall. He died almost immediately and his son very soon after so, by 1713, the advowson of the church had been sold to St. John’s College, Cambridge, and the Manor of Cockfield Hall was sold to John Moore, whose family held it until 1834. Since then it has changed hands many times: John Wright of Covent Garden conveyed the manor to James Cuddon in 1839 and his sons conveyed it to the Misses Manning in 1853 – whilst remaining as stewards. The next owner was Samuel Buck of Hawstead , who gave the land for the building of the school. The Lordship then passed to Thomas Jennings (whose son was living in Cockfield Hall at the time) and he held it from 1865 until it was bought by George Frederick Beaumont in 1899. His family held numerous Lordships all of which were sold in 1954 when Miss Constance Dixon bought Cockfield and subsequently held a Court Leet at the (now Old) Rectory in 1956. It then passed to Mr. R C Shawyer who left it to his niece Gail Bate who sold it to Mr. Arnold Wolowitz in 1997 when, very sadly, the title, all the documentation, and the ownership of the greens were each sold as separate lots, thus fragmenting over one thousand years of the history of our village. The documents were also sold privately but are now available for research in the West Suffolk Record Office. Great Green had been sold to the parish council in 1950 having been dug up and farmed during the war, and since 1997, Buttons, Old Hall, Smithwood and Windsor Greens have been in private hands, whilst Cross Green was given to the parish and Parsonage Green purchased for the parish by public subscription. ‘Lord of the Manor’ is one of the oldest titles in England and pre-dates the Norman Conquest. It has absolutely nothing to do with the British honours system. The Manor was the pivot of the feudal system and, by the time of Edward the Confessor, the Lord was the most important person in village affairs and was responsible for collecting taxes for the King and dispensing justice. He would have been the largest landowner in the vicinity, the copyholder, and the people living on the manor would owe him certain services in return for protection and the land he allowed them to use. This ranged from money rents to working so many days a week on the Lord’s demesne without wages (known as fealty). Skilled men could rent a smithy or mill from the Lord and keep the profit for themselves. Manorial courts dealt entirely with land and property and from the mid 13th Century were obliged to appoint a Parish Constable annually who would have been unpaid but could claim expenses and carried considerable responsibilities. King Edward III instituted Justices of the Peace, many of whom were the local Lords who had to be ‘of good behaviour’ and resident in the County. At the economic level, the medieval period saw enormous changes resulting in the evolution of paid labourers, ‘free’ to find work where they could. Reclamation of waste was granted out by the Lords on favourable terms to people who became copyholders in return for a half-yearly rent payable at the Lord’s court. In 1922, the Law of Property Act abolished copyhold tenure. The Act confirmed many of the historic rights long enjoyed by the Lord of the Manor including the right to hold markets and fairs, the right to common land and manorial waste, rights to mines and quarries, timber rights, fishing rights and so forth. In purchasing a Manor, one inherits the status that this form of tenure implies and becomes the successor in title to a line of men and women, many of whom have had a pronounced influence on history. Robert Louis Stevenson returned to Cockfield in July 1873, now a law student at Edinburgh University and escaping from parental disapproval of his love of literature and his espousal of the controversial work of Charles Darwin, “The Origin of the Species”. He described his time at The Rectory “as a certain very fortunate visit” meeting there two persons who were to have a huge influence on his life: Mrs Fanny Sitwell with whom he fell in love, and Professor Sidney Colvin. Colvin, who was prominent in the world of literary publications, immediately recognised the genius of the young Scot and tirelessly promoted his interests and in December 1873 Robert Louis Stevenson’s essay “Roads”, about his experiences in Suffolk was published in the Portfolio. This was the first of many such publications and for the rest of his life RLS regarded Colvin as his mentor as well as his close friend. His letters to his friends, and to his mother in Edinburgh, give a brief glimpse of the leisurely life at the Rectory 140 years ago and of Suffolk village life. He describes walking to Lavenham, getting lost among the fields on the way back and tumbling into a ditch. He walked across the fields to Bradfield Combust, “an old village with a church, store of antique cottages and a most beautiful avenue of elms”. He visited Long Melford and Lavenham“both exceptionally placid, beautiful, old English towns” but which in some ways RLS found foreign to his Scottish eye with “great screens of trees that seem twice as high as trees should seem ….” He even helped his hosts entertain the children of Cockfield school to a picnic and races in the The Rectory gardens. He composed his first published essay while staying in Cockfield and it has been suggested that the seeds of his novel “Treasure Island,” first published in a periodical in 1881, were sown here. Perhaps his enjoyment of the ornamental moat with its two islands, recently restored in the gardens of The Rectory, provided the inspiration for his classic tale. There is no doubt that Robert Louis Stevenson’s short visit to Cockfield influenced the rest of his life. Sidney Colvin and Fanny Sitwell, who were eventually married, remained devoted friends and correspondents, with RLS dedicating many poems to them both. So, as you sit on a warm June evening, enjoying the performance of Robert Louis Stevenson’s “Treasure Island” in Cockfield school field, listen for the echoes of a “strong Scottish accent” as a slight young man with long hair, wearing a velvet jacket and a straw hat walks up the hill past you, in deep discussion with a serious, bearded professor, and the Great Eastern train puffs away in the evening light.